Proposition C to appear on November’s ballot is a long time coming. It’s San Francisco’s opportunity to tackle the humanitarian crisis of homelessness while transforming the lives of thousands of our neighbors – keeping vulnerable tenants housed and housing those without homes. It makes good fiscal sense: If we don’t house people, we spend more on health care and police costs, so in the end it is cheaper to provide housing. Prop. C would levy a half-percent tax, on average, on SF business revenue of more than$50 million, and would impact companies that just got a massive Trump tax break. While no companies are coming forward thus far and saying that they would be paying more than they did a few months ago, the dinosaurs at the Chamber of Commerce are screeching like wounded tetradactyls about paying into this fund. They have very little in terms of rational arguments: Apparently the “we just got a break we shouldn’t have to pay more” and the “why should only the wealthiest companies have to pay” messages are not turning voters against it. So they have resorted to the age-old political trick: Lies. Big, brazen, dirty, desperate lies, that are easily corrected. Look this is a democracy, everyone has different perspectives. The Chamber opposes most taxes, no matter what. We get that their entire point is to protect the bottom line of business, and while we think this is short sighted, because the benefits of addressing homelessness far outweighs the costs of not addressing it, we believe they are entitled to their opinion. However, lying to voters? That’s just plain wrong. And yet, these big-business interests are lying at speaking engagements, on the radio, on twitter. They are so brazen, they even put their lies into the voter handbook. They have even offered up the crazy lies to the SF Chronicle – and admitted to putting out this same false statement to voters in a poll. Immoral. Brazen. Arrogant. Sound familiar? Well it should, it is straight out of Donald Trump’s playbook. This is kind of nutty. The Prop C opposition put out a push poll – those are polls that they use to influence voters. They then put out a big fat desperate lie in that poll, and then went on to pitch that story to Matier and Ross at the Chronicle, who then printed it. What did it say? It said that if our measure passes we will spend half a million dollars per person to house them. Once they told voters the lie, voters were less likely to support. This ended up being the story, not the lie, but we feel like the lie makes for a much better story. How in the world could they have gotten to half a million when the real number is $25,000 per person year to house people under Prop C. (Simple Prop C math: $150 million divided by 6,000 people or 4,000 households=$25,000 per person per year). Even if they take the total and add the current spending and divide by 4,000 and multiply that by five years, they don’t get to that crazy number! Well, turns out they did some baffling and creative math. Enough to make elementary math teachers’ heads swirl. Luckily, the Chronicle had just published the real costs here a couple days earlier. We took a little look at this, and just a quick google search revealed some numbers. The police department budget alone is just under the total. SFMTA, which is the department that runs Muni? A quick search reveals their budget is twice as high as the homeless budget — even with Prop C revenue added in. The SFMTA has a $1.2 billion two-year operating budget. The agency’s capital budget in 2020 is $630 million, and that’s on top of the operating costs. We won’t even bother with the library budget amount. On their website they added in a couple more departments just for measure. The Chamber of Commerce and their campaign numbers are just plain silly. The reality is the current homeless department budget in San Francisco is just 3 percent of the city’s budget. Time and again, the Chamber argues that we “just be more efficient with what we have.” Well, our homeless budget today is mostly spent on housing 9,500 people at a cost of $26 per person per night, plus paying a small portion for medical services, outreach, and drop in centers. That’s pretty efficient. Sure, we could move the money around – but what would that get us? The overwhelming majority of the homeless budget in SF today pays for housing; do we want less of that? Prop. 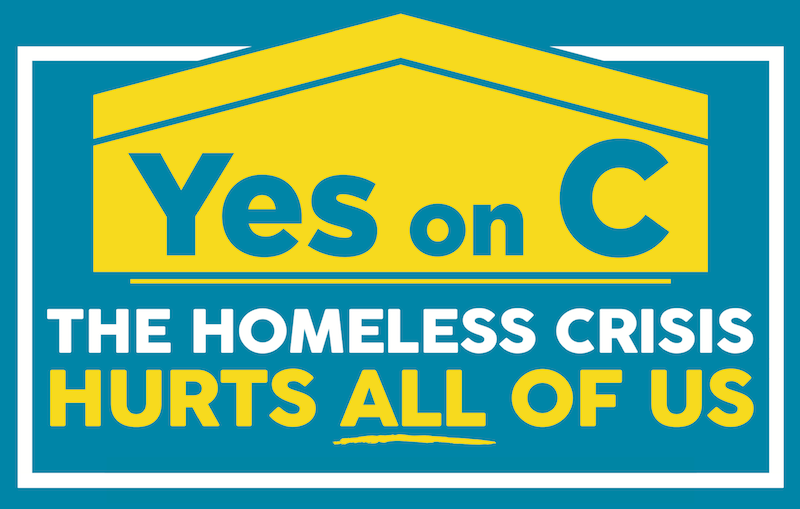 C would bring homeless spending in SF to about 6 percent of the entire budget. That includes all state, federal and other private grants, not just city dollars. For the number one issue that San Francisco is facing, that should be about right. The City and County of San Francisco is in a unique position of being the only combined city and county in California. There are very few combined cities and counties in the country. We looked at Washington DC, a city of comparable size. Washington DC. has a budget of $14.6 billion and a population of 693,972, which would be a per capita city budget of $21,037. It is therefore incorrect to state that San Francisco city government already spends more per capita than any big city in America; Washington DC spends less than twice our per capita spending. There is a lot of confusion among voters on this issue; they know we are spending money on homelessness and they don’t see the results. That is because the results are hidden – once homeless people are housed, we don’t see them anymore on the streets. We just don’t have enough housing for everyone. 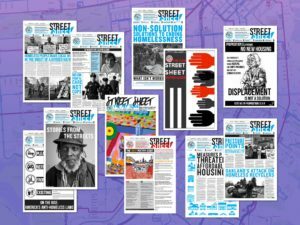 Opponents also argue we spend $51,000 per homeless person – A FULL FIVE TIMES MORE THEN WHAT IS ACTUALLY SPENT. Here are the real facts on how the city spends its money. Paid anti-Prop C canvassers were asking to put up No on C signs in businesses in District 10; they pitched that this would increase taxes for all businesses. In 1999, San Francisco spent $104 million on direct services for homelessness and there were 7,000 people living on the streets. Today, the budget is almost four times as large and there are still 7,000 people on the streets. This is clearly just plain bizarre. Do you think maybe since 1999 that not one more homeless person has become homeless? No housing crisis? No rising rents? No loss of public housing? No real-estate speculation? The budget has grown to house people; we just need more, and that costs money. If the budget had not increased, we would have thousands and thousands more on the streets. In the crafting of Proposition C, we built out the strategic framework of the homeless department, and we know where the housing is going, and we have a very specific plan to transform the crisis. Proposition C proponents got no input from the business community or Mayor-elect London Breed (stated on KALW your call radio by Jess Montajaro). Every single mayoral candidate had input BEFORE we submitted the language, including Mayor Breed. We reached out to as many elected as we could.They all had an opportunity to give feedback on draft language. We got input from all the pertinent department heads – DPH, DHSH, MOHCD. We got input from hundreds of people with lived experience with homelessness, those working on the front lines addressing the crisis, and those running programs for homeless people. We even talked to the Chamber of Commerce. In fact, we incorporated that feedback; the Chamber asked that we exempt commercial rents, and that we have a variable rate that is proportioned based on current structure. We did all of that. Retail has a much lower rate as a result in our measure, and there will be no tax on commercial rental income. All that input resulted in a carefully crafted, broadly supported measure that is our opportunity to finally address the homeless crisis. Stop listening to the lies. Look at the facts of Prop. C.
Jennifer Freidenbach is the director of the Coalition on Homelessness.